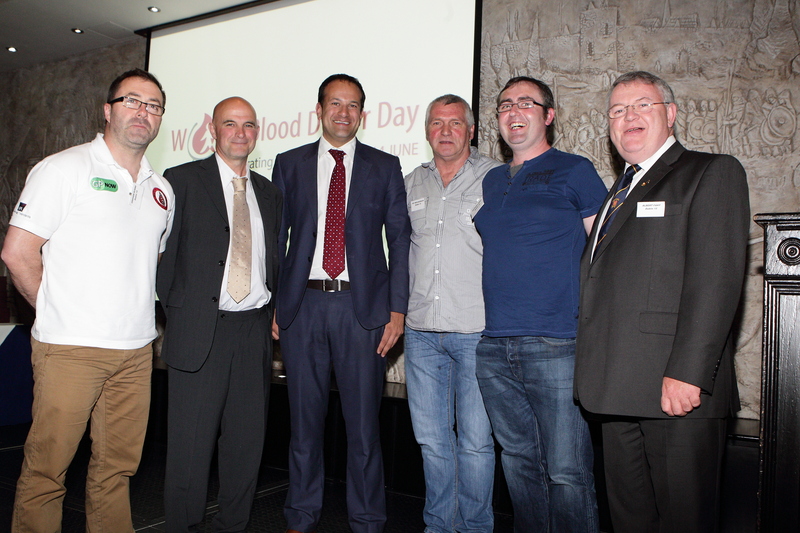 With local blood donors from Dublin 15: Graham Dunne, Michael Norton, Pat McLoughlin, Anthony Hoey, Albert Fahy. I want to thank the Irish Blood Transfusion Service for inviting me here this evening to present awards to those of you who have achieved the milestone of 100 blood or platelet donations. I’m delighted to be part of this event which recognises your achievement. Events like this are also important for raising public awareness about the importance of blood donation, and to encourage more people to become regular donors like the award recipients tonight. I know that everyone here understands the importance of being a blood donor. Access to safe and secure supplies of blood and blood products is a fundamental requirement of our health service. Every year, about 1% of the population needs a blood transfusion, and one in four of us will require blood at some point in our lives. The IBTS collects around 3,000 units of blood each week. Great efforts are made by the IBTS and by donors to ensure that blood will always be available when we need it. You can be proud of your ongoing support. A reliable base of voluntary unpaid blood donors, who give blood regularly, guarantees a safe and consistent blood supply. The continued success of our blood transfusion service depends on the loyalty of you, its donors. Without your generosity, our acute hospital services would have great difficulty treating a variety of conditions, often in circumstances where blood is critical to survival. The awards ceremony this evening is just a small token of appreciation on my behalf, on behalf of the Irish Blood Transfusion Service, and on behalf of all the patients who have received these donations. It takes many years to reach the milestone of 100 blood or platelet donations and I congratulate and thank you all for your dedication and commitment. You should be proud that your generosity has made a real difference to the health of so many people. In some cases your generosity has been the difference between life and death. We will hear later from a blood recipient, Elizabeth Whearity. Her story brings home just how essential blood is to the health care system. The campaign aims to highlight stories from people whose lives have been saved through blood donation, as a way of motivating regular blood donors to continue giving blood, as well as people in good health who have never given blood, particularly young people. In the past two years, a number of Gardaí, along with RTE journalist Paschal Sheehy, took part in a cycle around Ireland to promote blood donation. This year they have taken things a step further and travelled to the Headquarters of the WHO in Geneva. They arrive today to celebrate World Blood Donor Day. I want to say ‘well done’ to all involved for their willingness to support the IBTS in raising awareness of blood donation. The national donor collection programme relies heavily on the valuable contribution of the voluntary donor organisers. They ensure that clinics are advertised locally and assist in the preparation of venues for the mobile clinics. They are also at hand to assist in the smooth running of these clinics. Their efforts are much appreciated and I want to pay tribute to them here tonight. The network of voluntary donor organisers and the local clinics remain an essential aspect of the national donor collection programme. This evening I also want to commend the IBTS for their continuing efforts to expand the donor pool. The IBTS has embraced technology to the benefit of all blood donors and recipients. The use of texting, Facebook, Twitter and their smartphone app have become a cornerstone of communication with donors, allowing the IBTS to keep in regular contact with donors. Another area in which the IBTS is working to expand the donor pool is in the management of haemochromatosis patients. People who have haemochromatosis absorb too much iron from their diet. It’s estimated that there are around 40,000 people with the genes for Hereditary Haemochromatosis in Ireland. Once diagnosed, it is treated by removing blood regularly to get rid of the excess iron. Regular removal of blood, when begun early, can prevent or stop organ damage. If damage has already occurred, treatment should halt any further damage and, in most cases, will bring about some improvement. As the treatment for haemochromatosis involves blood removal, and because the patients are often well and are eligible to be blood donors, the Irish Blood Transfusion Service has in recent years played a key role in services for those who have the condition. This service is free of charge to those with haemochromatosis and is currently available in three fixed clinics. The IBTS started a programme of treating haemochromatosis patients at its Stillorgan Centre in 2007. This Centre operates a full care model where the IBTS manages the on-going care of the haemochromatosis patient, while performing the necessary venesections as required. A total of 600 patients are now being treated in the Stillorgan Centre, which is at full capacity. 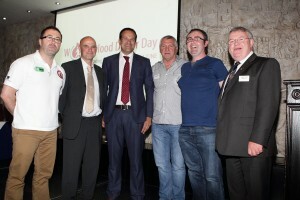 More recently, haemochromatosis services have been established at the D’Olier Street Blood Donation Clinic in Dublin and in the Cork Centre. The IBTS is currently exploring how best to expand the service to other parts of the country. It’s a very successful initiative and I hope it continues to expand and brings benefits to both haemochromatosis patients and the IBTS. I again want to thank the IBTS for this opportunity to pay tribute to long-term donors. No matter what other awards you may be given as you go through life, you will always have the satisfaction of knowing that this donor award is pivotal, because it recognises that you have literally given the gift of life to others. I urge you to continue to give blood and platelets in the coming years with the same unselfishness you have displayed in the past. I also urge you to encourage your friends and families to join you as donors and to join in the satisfaction I know you get from your donations.